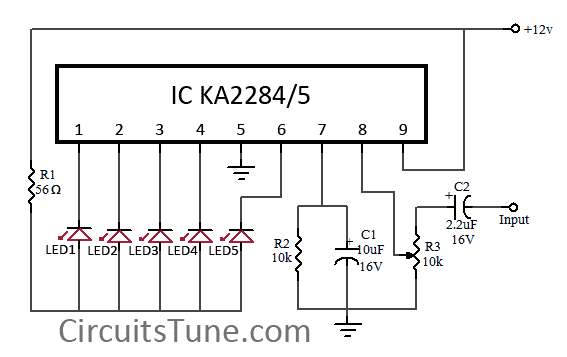 This is a simple circuit diagram of 5-LED audio VU meter using IC KA2284/KA2285. The KA2284, KA2285 are monolithic integrated circuit. It is a logarithmic display driver IC. And it is Bar type display driver using 5-Dot LED. The KA2284/KA2285 has a wide range supply voltage capacity of 3.5V-16V, but we recommend to use about a 12VDC power supply. AC signal Meter or DC Level meter. Audio VU(Volume Unit) meter in amplifier or such kind of device. Here IC AN6884 is also can be used instead of KA2284,KA2285. These all are almost same.